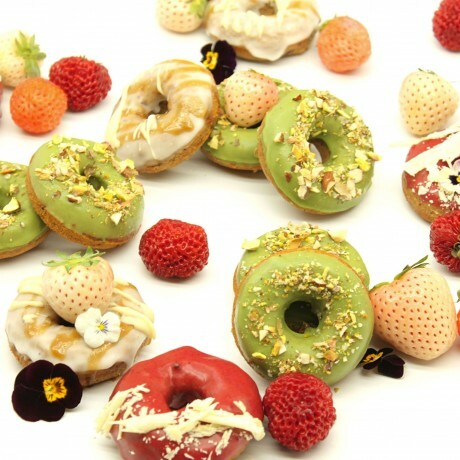 Freshly made to order, we are introducing our famous organic box of 9 handcrafted plant-based donuts. Red velvet, lemon coconut caramel, hemp wheatgrass. We are artisans patissier and each treats are crafted to give you the realest taste of quality. All our patisseries are 100% plant-based, organic, gluten free. Those pretty doughtnuts are nut free too. No cross-contamination with non-vegan food guaranteed. Shelf life: consume within 5 days of delivery. This product is made fresh to order (allow up to 3-5 working days) and then shipped using Next day delivery. Dates, sunflower/rapeseed/palm/coconut/linseed butter, coconut and cane sugar, gluten free flour (buckwheat, rice, maize, tapioca, potato), ground nutmeg, ground cinnamon, molasses, white chocolate (cacao butter), superberries powder, beetroot juice (freshly made not from concentrate), wheatgrass, hemp, lemon/lime, xanthan gum, bicarbonate of soda, vanilla. Made in a kitchen nuts. The food was delicious would definitely order again. I ordered the Rawzelnut vegan cake and macarons for my daughter's birthday. She loved it and told me it was beautiful as well as delicious. Thank you so much. I will definitely buy again. Fantastic food and excellent service, as usual! Fantastic food and excellent service, as usual! As a vegan, I am in food heaven. Always something new to try. Thank you so much! I have ordered the amazing macaroons cake and their famous cannabis brownie for my 30th birthday and it was lush!!! A great vegan, organic and sugar free treat .Everyone loved it! !